When the year 1999 passed into the new millennium, we were living in Maine, and decided we would spend that New Year's Eve cooking globally. The fun thing was choosing the hors d’œuvre-of-the-moment from the cuisine where it was turning midnight at that hour. That worked fine until we got over the Atlantic Ocean... for many hours. I simply opted for a seafood theme for those ocean hours. This year, we decided to do hourly hors d’oeuvres through the afternoon and evening, but this time with an all fish/seafood menu. 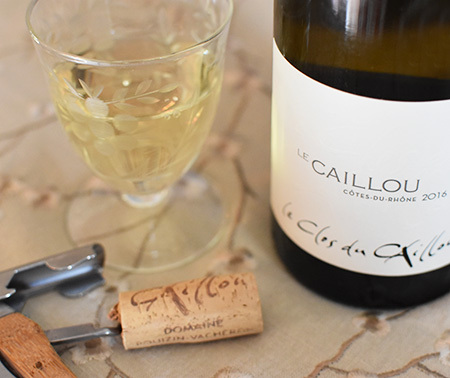 The inspiration for this menu was a bottle of 2016 Côtes du Rhône white wine, Le Caillou. 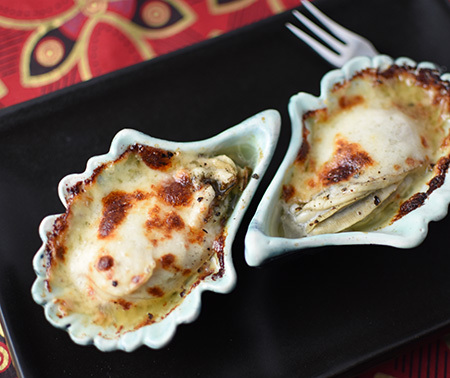 You can read about the pairing in my monthly Wine with Food column in the Provence WineZine. In the sequence of intermittent apps were smoked whItefish spread, grilled red Thai curry shrimp on lemongrass skewers, smoked salmon and goat cheese on cucumber slices with dill, homemade blini with crème fraîche and caviar, grilled oysters, and finally salt-and-pepper calamari served over a salad of mizuna with a soy-citrus dressing. The calamari recipe came from a new book we received from Cathy and Heather for Christmas: Caz Hildebrand’s The Grammar of Spice. 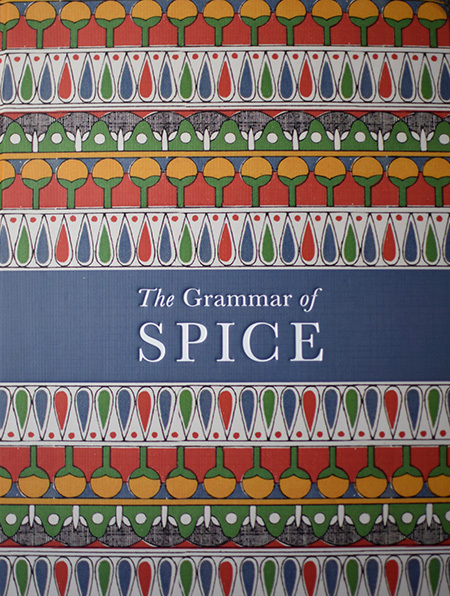 Beautifully illustrated with lush chromolithographs by 19th century Welsh architect Owen Jones, this book gives you the origin, history, and usage of each spice, as well as suggested pairings and a recipe. Markipedia peeked over my shoulder at the illustrations and said, “Hmmm. These remind me of Owen Jones, who wrote The Grammar of Ornament [here is the book online] in the 1850s.” (Do any of you know how annoying this is??). He then went and pulled his two massive facsimile volumes from the library shelf. 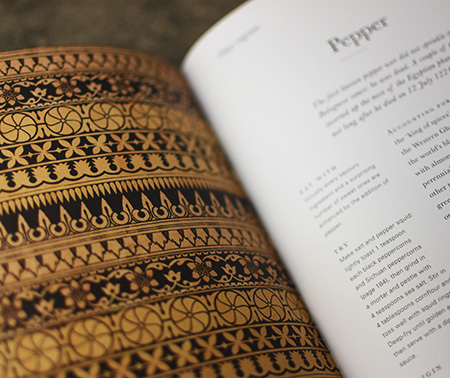 By complete happenstance, when I flipped open the book, the first spice I saw was Pepper. The accompanying recipe for salt and pepper calamari looked so good that we decided it would be the ultimate dish for our New Year's Eve celebration. The only change I would make (and it is reflected below) is that I would use less salt than called for in the recipe. And, instead of simply serving it with a dipping sauce, as suggested, we used the sauce as a dressing and served the calamari over salad. Mizuna was a perfect match for the calamari and sauce, but arugula would work well, too. I won this beautiful mortar and pestle from a contest on Perfectly Provence. We will definitely be making this again, and look forward to trying many other recipes in the book. While the New Year is now months behind us, I know many are glad to see that spring is on its way! 4 cups mizuna or arugula, on four salad or dinner plates. Trim the tentacles off the calamari tubes, then cut the tubes into 1/4-inch rings. Trim tentacles, of needed. Set aside. Whisk together the lemon juice, soy sauce, Mirin, oyster sauce, rice wine vinegar, and grated ginger. Set aside. 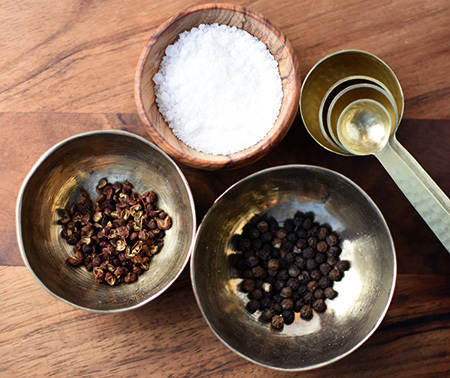 Grind the peppers in a mortar and pestle or a spice grinder. Place them in a large plastic bag and add salt and cornstarch. Shake the bag to mix the ingredients. Heat 1/2-inch of oil in a large shallow skillet. Add the calamari pieces to the bag with the salt and pepper and shake well to coat. Carefully drop the calamari pieces into to the hot oil and fry till golden. You may want to do this in batches; the calamari shouldn’t be crowded in the pot. When golden, remove calamari with a slotted spoon and drain them on several layers of paper towels. Toss the mizuna with half the dressing, and divide among four plates. 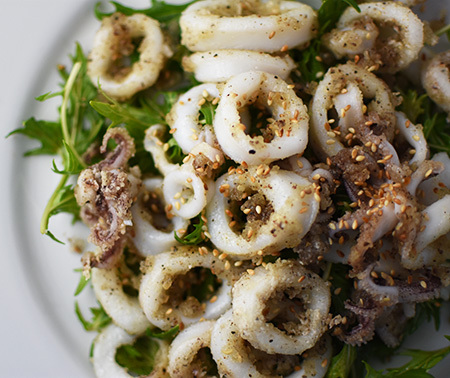 Top each salad with a quarter of the fried calamari and drizzle with the remaining dressing. David, the changes you made to the dish are perfect. With the calamari over salad and the dipping sauce used as a dressing, you have a fine dining masterpiece. I'm not a calamari person myself, but I know so many people who are. This is one I'll be sharing. Thanks for sharing this with your friends, Jean, and for commenting even though you aren't a "tubular" fan! And thanks, also, for the nice comment on the Provence WineZine. Happy weekend! That is so true David, we went to bed at 10:00 New Year’s Eve. Exactly! Not sure we even made it till 10:00! David, each dish you shared in this post looks amazing :) I was excited when I saw your post about this recipe on IG this morning. I LOVE calamari, but I've never made it at home. I can't wait to try it, it looks absolutely delicious! If you love calamari, you will love this, Marcelle! What an incredible memory, Greg. I agree that you must have had the most thrilling experience in the category of “unexpected!” Thanks for sharing... such a dichotomy, our two clinks of the glasses! Brilliantly planned celebrations: huge fun for the whole day!! Eat calamari, usually Asian-style, about once a week . . . love it: roughly same ingredients, but stir-fry for about one minute only . . . yes, they often do end up on a pile of Asian greens :) !! Once a week? That is impressive, Eha! They are so tasty and cook so quickly! People always cook them too long and that is why they think of calamari as rubber bands! 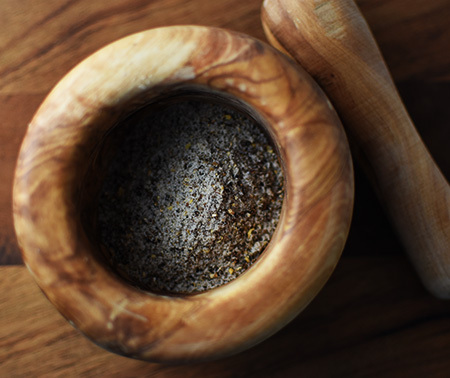 David that mortar and pestle looks so beautiful with the pepper - great photo! Thanks, Carolyne! I love it - such a beautiful and functional piece of art! I remember reading about your wonderful NY's Eve tradition! I love it. All of these look fabulous, and I just adore calamari! I have so much going on; posts to do from my recent trip, family arriving on Friday from Canada and friends from Australia (why does everyone come all at once?) Ugh! Wish I could just go buy some calamari and make this today! That book sounds great, all great sounding dishes and the calamari looks lovely. And I just found out, Caroline, that the book was purchased for me from the Victoria and Albert Museum in London! You are so close to the source! Your NYE tradition is brilliant and admirable. 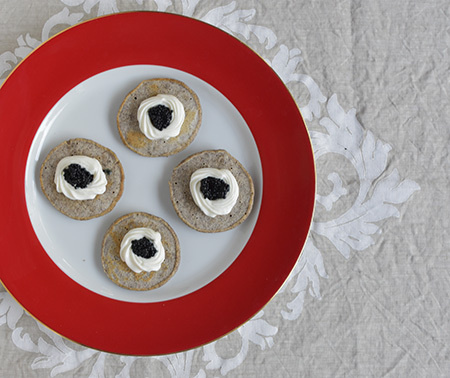 I struggle to stay awake beyond 10.30pm on 31 December, so I'd be a com plate fail if I were to try what you do. Trying this calamari, however, would be a delight. Those wonderful flavours! I really ought to cook squid more often. John - 10:30 would be a real stretch for us, too! We don't cook squid all that often, either. I do remember making your stuffed squid recipe, though, and thinking the same thing: "These are tasty little things!" Thanks, Food Trotter! You should check out the book. The recipes are perfect for people like us - more suggestions than actual recipes but it’s a great way to cook! I love the way you two celebrate! And the app sounds delicious -- I love all of those Asian flavors. Celebrations are so important, Valentina - don’t you think? We find any excuse to make a day special! Love, love, love calamari! What a fun way to celebrate New Year's Eve. Especially with all the coastal seafood resources! Will need to consider this for next year! 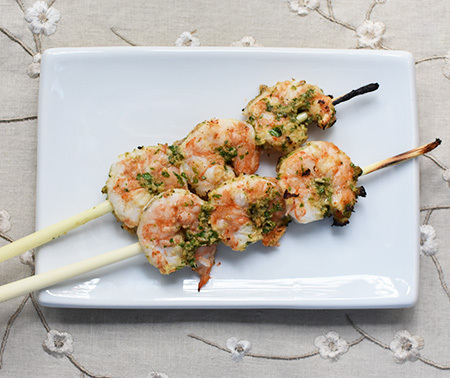 An afternoon or evening of appetizers is one of our favorite ways to mark a special celebration! I hope you do this next year – it's lots of fun! Sounds like a fun celebration, nonetheless! Steal away! It is really fun! I really like how you changed the recipe with the calamari topping the greens...it sounds perfect. 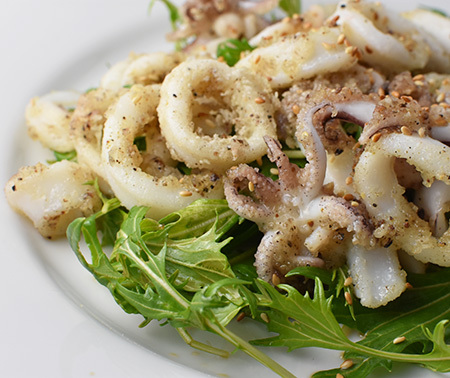 The mizuna was such a perfect combination with the calamari and the dressing - we love it! David, I could have sworn I commented on this post because, of course, you wrote this in conjunction with your post on Provence WineZine, but, more importantly, because the meal looks so good! It sounds like a perfect match for the white Rhone you selected but I suspect it would marry well with many rosés as well. The book you mention sounds very interesting, too! 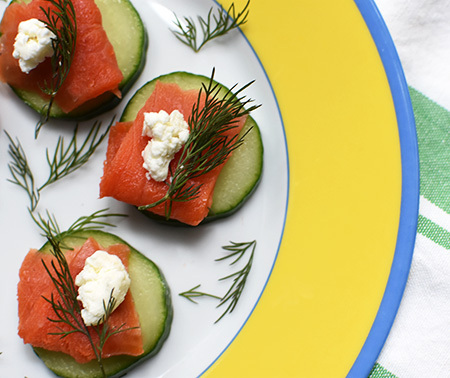 I agree - almost everything we made would be lovely with a rosé, Susan!